Each year in March the city of Valencia is home to the Fallas Festival (a commemoration of Saint Joseph), which means that a swarm of people descend on the city –some estimate that as many as one million tourists visit Valencia during the festival. I was so happy that this year I got to be one of them. Trying to describe Fallas to someone who has never been is rather difficult, and as I learned, no description will prepare you for the real thing. The best way I can explain it is a giant five-day block party but on a city-wide scale. Every neighborhood participates by putting together a falla, a kind of fantastical sculpture/monument. 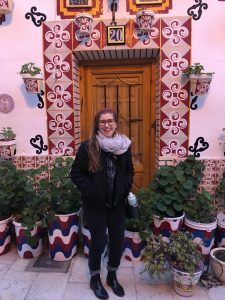 There are large and small fallas of varying themes, but the thing that most have in common is that they are humorous, colorful, and oftentimes critiques of society. 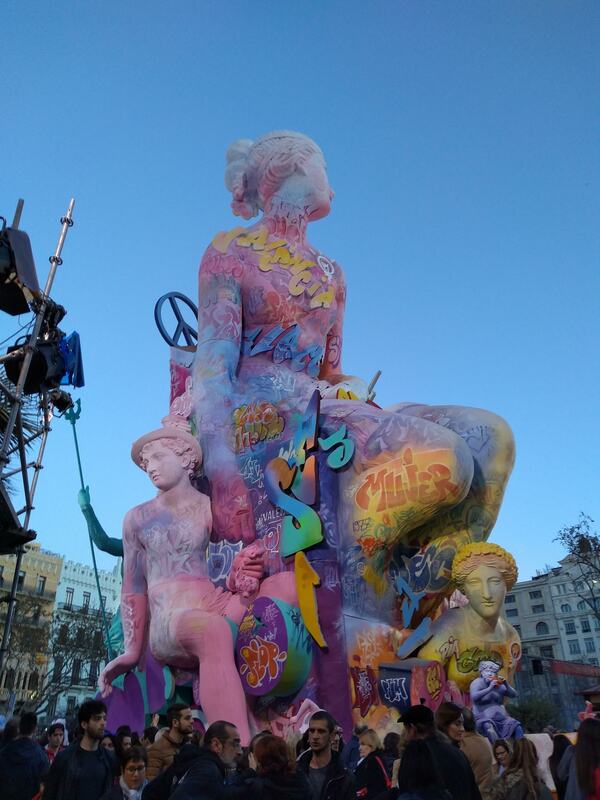 On the last night of the festival, every falla is burned down in a symbolic gesture of welcoming spring and rooting out the negatives of society. Throughout the festival, children are running around with firecrackers, everyone is stuffing their faces with buñuelos, and the people of the city are marching around in their traditional styles of dress. I highly recommend attending Fallas if you ever get the chance. 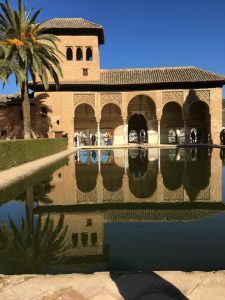 It’s such a spectacular look at Valencian culture, and an event that I will never be able to forget. My description cannot even come close to doing justice to this grand festival, which is so much bigger and better in person than I could ever describe. Last weekend I went to Barcelona, the capital of Catalonia. While there I visited Park Güell, La Sagrada Familia, Montjüic, and other locations around the city. Barcelona is such a huge city that it’s impossible to see everything in one weekend, but that didn’t stop me from walking more than 30 miles in the 2.5 days that I was there trying to see as much as I could. 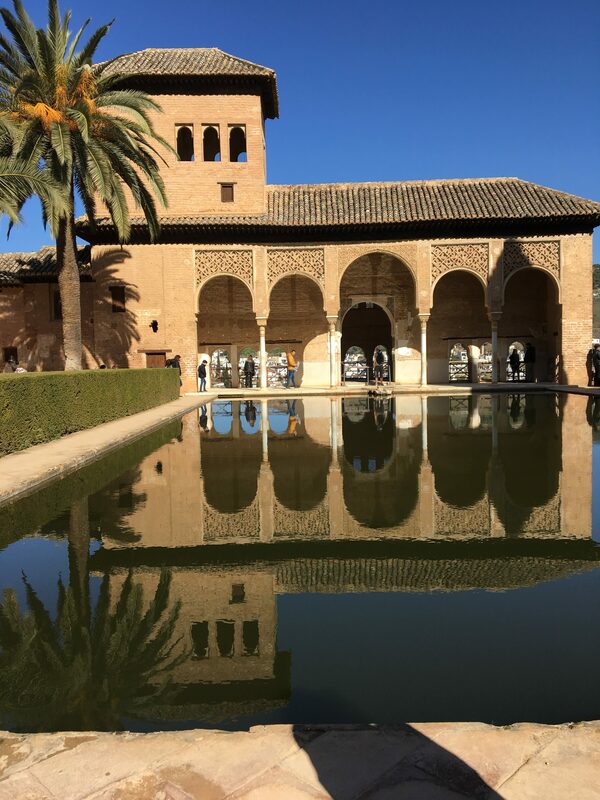 We visited Barcelona during an exciting time, as March 8 was the International Day of Women. Last year, Spain staged strikes where more than 5 million people participated, and the movement continues this year with marches scheduled all across the country to demonstrate support for gender equality and an end to gender-based violence. The march in Barcelona was one of the biggest of the country. 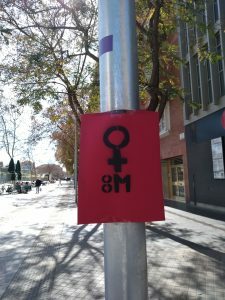 Even after the marche ended, the city was sprinkled with posters and graffiti reminding citizens that the fight for gender equality will continue even after March 8. I’m so grateful that I was in Barcelona to witness this tremendous feminist gathering, and I’m even more grateful that I have had the opportunity to travel to Spain where this movement began. The friends I have made here inspire me with their feminism and the work they do to make the world a more tolerant, vibrant place to live. The students at the University of Alicante are doing really amazing, incredible work. 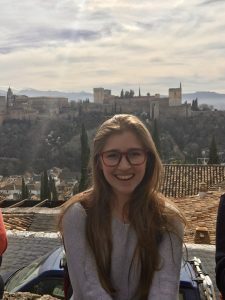 Just last week I attended a conference focused on feminism and its role in the world of literature and translation. One of my friends presented about her own thesis regarding fairytales reimagined by women. 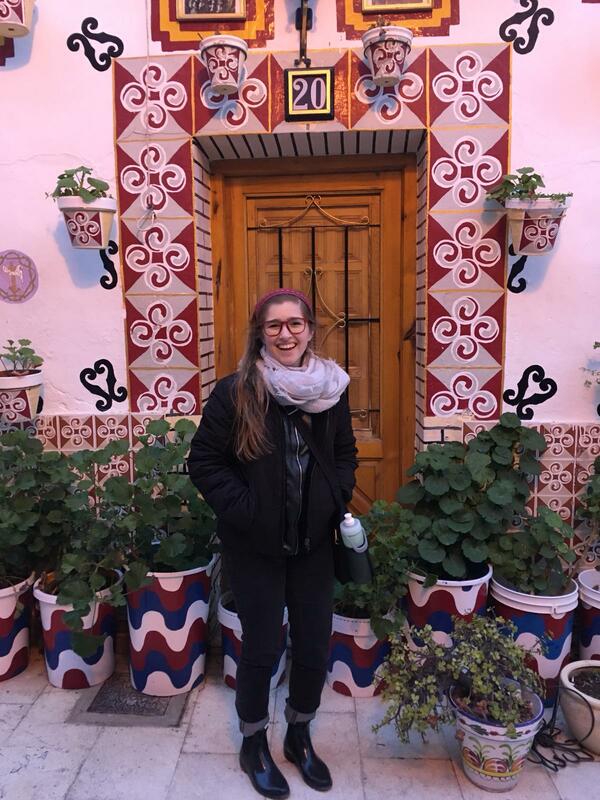 The University of Alicante offers so many interesting seminars, presenters, and conferences that I am constantly reaffirmed that my decision to study abroad was the right one because I am learning so much here that I can’t wait to bring with me back to Oklahoma. Hello from sunny Alicante! I have been in Spain for three weeks now, but there are still days that I wake up and forget that I’m here—until I hear the sounds of Spanish from the streets below my window and remember that my dream of studying abroad is actually happening. It’s been a roller coaster of a ride so far, between juggling classes, navigating the city, and meeting new friends, but it’s also been thrilling. I’m living with a host family and another exchange student from Japan. I love our dinners together where we talk about differences between our countries and Spain. In fact, meeting other international students has been one of the highlights of the trip so far. I have made friends from Montreal to Algiers, as well as several from right here in Alicante. I’m thoroughly enjoying my classes at the University of Alicante. I am taking two linguistics classes, an Arabic class, and a translation class, so my language-loving heart is just loving it here. 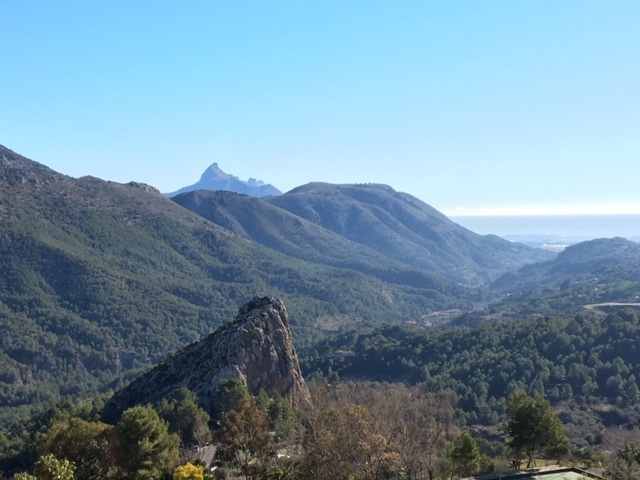 Plus, the gorgeous weather, stunning views, and Mediterranean architecture certainly makes each and every day here an exciting, new adventure. I am so fortunate to call this city home for the next five or so months, and I can’t wait for all the adventures that lie ahead. Protests began November 17 in France in response to President Macron’s announcement of an increase in fuel taxes. The protests have been deemed the “yellow vest” protests since many of the protestors are wearing yellow safety vests. The proposed fuel increase, which has since been tabled, was opposed most strongly by the rural population where the tax increase would be most felt. The protests have become more widespread as the focus shifts to a more general protest against President Macron who many feel is out-of-touch with the ordinary people of France and acts on behalf of the wealthy. Several people have died during the protests. According to NPR, three of those killed died in “traffic accidents caused by roadblocks set up by yellow vests” and another woman was killed after being struck in the face with a canister of tear gas. Hundreds more have been arrested. The protests have taken a violent turn. Some yellow vests claim that others have hijacked the protests and are corrupting the protests’ intentions. The protests have been ongoing for more than four weeks. While numbers are increasing, there is no clear end to the protests in sight. On October 7, 2018, Cameroon held presidential elections in which the current president, Paul Biya, won re-election. Biya has been in office since 1982. His re-election caused serious backlash and has escalated a growing divide between the anglophone and francophone regions of the country. Since 2016, Cameroon has experienced growing tensions between these two regions which, in addition to language differences, face major economic divides. The anglophone region is is in the minority, and many are protesting what they view as an unequal distribution of resources. Some are calling for a federal system to address the problem, while others are calling for independence and the formation of a new state called Ambazonia. Election turnout was historically low — only 54%. And in English-speaking regions the turnout was only 10%, which can be explained by protests and escalating violence in those regions. As a result, some do not recognize the elections as valid. Although this humanitarian crisis is not receiving much media attention, Cameroon will be a state to watch, especially with some reporters saying that the tensions between the regions are tipping the state toward civil war. Already the violence has caused the displacement of tens of thousands of Cameroonians. For further reading, including a background on Cameroonian independence, please see below. 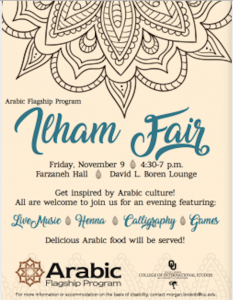 T he Arabic Flagship Program hosted a new event this semester called the Ilham Fair. Ilham in Arabic means ‘inspiration.’ This fair was a large social event designed to share Arab culture with the OU community. There was live music, calligraphy, henna, games, and home-cooked dinner. The food was delicious. International students from around the Middle East cooked a massive feast for all of the participants, which was no small feat. I had delicious samosas, ate a lot of stuffed grape leaves, and I sampled koshari, a traditional Egyptian dish. In addition to the yummy food, the live music was a real treat. One student provided the live music, and he seemed to be playing several instruments at once. I had never heard anything like it, but it really enhanced the atmosphere of the event. I hope that the Ilham Fair becomes an annual tradition of the Arabic Flagship Program because I feel that it has a real possibility of growing each year and becoming a tradition that the Flagship can be proud of. I highly recommend that any student attend the Ilham Fair if it returns next year because it is a great introduction into Arab culture. Plus, what’s better than some free food and live music with friends? As always, I attended the semesterly Arabic Talent Show hosted by the Arabic Flagship on November 30. It’s hard to believe, but this was the fifth talent show that I have attended. This year featured a number of videos from the beginning and intermediate classes as well as several live musical renditions, including one by the colloquial class. I always love attending the talent show because it is truly a great way to showcase all of the hard work that the classes and clubs have done over the summer. I was especially proud of the fact that the Arabic Film Club submitted an entry this year. Our members wrote reviews of the films we watched over the semester, and these reviews were projected on the screen while everyone ate dinner. My favorite entry was by the Calligraphy Club, which only began this semester. Students submitted some of their best designs, and I was so impressed by the talent of the calligraphers who grew so much in such a short amount of time. I love this semesterly tradition, and I feel that the quality of submissions continues to improve each semester. 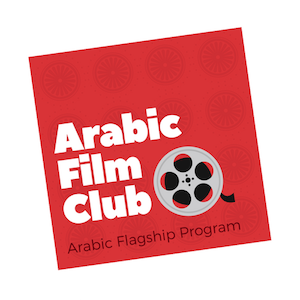 For the second semester in a row, I moderated the Arabic Film Club. This semester we watched Caramel, Terrorism, and Kebab, Omar, Tickling Giants, and Emara. Each was good in their own unique way, which makes it difficult to pick a favorite. I must say, however, that I really appreciate Emara for its uniqueness and themes. It is an animated series available on Youtube about an Emirati girl who works in her family’s coffeeshop during the day and fights crime at night. It has important messages about bravery and feminism, and I hope that the creator adds the second season soon. I also really enjoyed Terrorism and Kebab, an Egyptian comedy from the 90s. This was the second time that I watched it, and I found that I enjoyed it much more this time around. I understood the language and the humor better, so I found the movie to be more enjoyable. My favorite meeting was our screening of the documentary Tickling Giants, which we hosted along with the Egyptian club. Tickling Giants is the story of Bassem Youssef, Egypt’s first political satirist who had the most viewed show in the country’s history until censorship and intimidation forced the show to end. We catered food from Sisters restaurant — which was great — but I think the real draw was that we partnered with Egyptian Club and were able to grow our membership as a result. Because I will study abroad in Spain next semester, I will have to take a break from the Arabic Film Club. I know the club has been left in good hands, and I am excited to see how it grows next semester. Two of my friends and I went to the Asian Food Fair in the armory. It was pretty great. For just a few dollars, all-you-can-eat awesome food! The Asian American Student Association puts on the food festival every year to raise money for the philanthropy Holiday Head Start, which provides holiday meals for families in Norman.